In 2003, the Louisiana legislature created the state-run Recovery School District (RSD), which pre-Katrina was comprised of about a dozen and a half schools. Once Hurricane Katrina hit (in 2005), so did the Louisiana legislature in a calculated attempt to hand over most of New Orleans’ public schools to the state. The ultimate goal of this state takeover was to turn New Orleans’ public school system into an all-charter district. By the 2014-15 school year, all of the state-run, RSD New Orleans (RSD-NO) schools had been converted to charter schools. So, by the 2014-15 school year, the promotion of New Orleans as a state-run, “turn-around” district was wed with the promotion of the charter portfolio school district model. 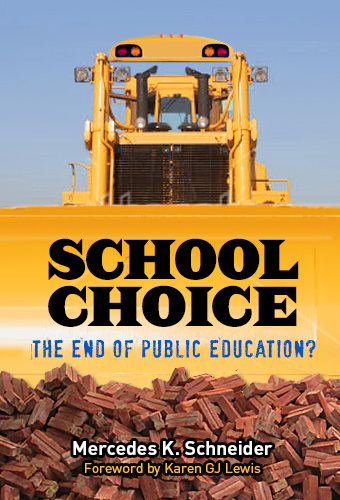 The big idea for the corporate reformers attempting to sell RSD-NO was that state takeover of “failing” local-board-run schools, coupled with converting those schools into charter school choice was the way to combat the “status quo” of traditional, local-board-run public schools. Given that the preferred metric of success for corporate reformers is the standardized test score, it only follows that the ultimate measure of success for RSD-NO would be ever-increasing, average ACT composite scores for senior classes graduating from its state-run, charter-portfolio-model halls. The problem is, of course, what to do if the RSD-NO high schools do not produce ever-increasing, average ACT composite scores. The 2012 average ACT composite for RSD-NO high schools– 16.8– was the highest that RSD-NO achieved to date. Since that time, RSD-NO high schools have been swishing around in the 16-point-somethings, but never hitting even 16.9. The next year (2013), 100 percent of Louisiana’s Class of 2013 took the ACT test. RSD-NO’s average composite dropped to 16.3. There was no LDOE ebullient press release that year, nor for the years 2014 (RSD-NO ACT: 16.4) or 2015 (RSD-NO ACT: 16.6). And by 2016, John White and his LDOE just stopped reporting average ACT composite scores for the RSD-NO high schools. Even though the Louisiana legislature decided in May 2016 to transfer RSD-NO schools back to the Orleans Parish School Board by 2019 at the latest, the current students in these schools have spent almost their entire academic lives under the auspices of RSD-NO and, as a result, have been chiefly educated by the independently-operated charter schools that state-takeover advocates have enabled to replace traditional public schools and have actively promoted as superior to traditional public schools. So, John White and LDOE should not be allowed to smoothly escape the reality of their failure to move RSD-NO high schools beyond a 16-point-something average ACT composite score. John White and LDOE did not report an average ACT composite score for the RSD-NO high school Class of 2016 or Class of 2017. However, I was interested in calculating these scores based upon the 14 high schools identified by LDOE as belonging to RSD-NO in 2015-16. Therefore, I submitted a public records request to LDOE for the number of student scores used to calculate each of the school-level average ACT composite scores. This info was available in the LDOE file for the Class of 2016 ACT scores but not for the Class of 2017 ACT scores. Based on the RSD-NO high-school student counts and corresponding school-level average ACT composite scores, I was able to determine that the RSD-NO high school Class of 2016 average ACT composite score is 16.7. And for the Class of 2017, the average ACT composite score for the same high schools (see note above regarding CW Carver) remained 16.7. Guaranteed admission to the University of Louisiana at Lafayette (ULL) requires an ACT composite of 23. For Louisiana State University (LSU), it’s a 22. For both the University of Louisiana at Monroe (ULM) and Southeastern Louisiana University (SLU), an ACT composite of 21 is preferred, but either an ACT English score of 18 or an ACT math score of 19 is required. The average Xavier University undergraduate has an ACT composite ranging from 23 to 28, with Xavier advertising an ACT composite of 24 necessary for admission to its nursing and occupational health programs. Nursing students must also score at least a 21 on the ACT math exam. For Southern University (SU), an ACT composite of 20 is preferred, but again, either an ACT English score of 18 or an ACT math score of 19 is required. And for the University of New Orleans (UNO), both an ACT English score of 18 and an ACT math score of 19 are required, and if the student’s high school GPA is at least 2.0 but not 2.5, an ACT composite of 23 is required. Thus, for all of its charter-portfolio fanfare, it is difficult to conceive of the state-run RSD-NO as anything but a flop based upon years of its sub-17 average ACT composites. The first step to addressing the issue is admitting that there is an issue. However, completely ghosting out the RSD-NO high school average ACT composite calculation even years before RSD-NO is formally dissolved certainly dodges any such responsible admission. Wouldn’t it be cool if the state released the whole distribution so we could see how few of the victims (graduates) of the RSD-NO schools achieved reasonable ACT scores (those that would suggest college readiness)?